This digital mirror alarm clock, which uses touch control design, can display time in 12H/24H mode and indoor temperature in °C/°F mode. Besides, it has 3 LED luminance levels adjustable. A perfect alarm clock for bedroom! 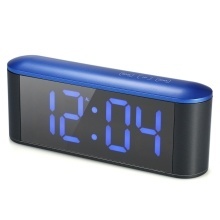 Mirror face digital alarm clock, also can be used as a small mirror. It adopts touch control design, you can touch top 3 keys to do all adjustments. Clear backlight LED display with 3 luminance levels adjustable: dark, medium, bright. Touch "Mode" key to switch the display among time(12H/24H), temperature(°C/°F) and alarm. With indoor thermometer function, temperature range: 0°C~50°C / 32°F~122°F. In night mode, LED display will automatically lower the luminance (default period: 18:00-06:00). 2 Power Supply: powered by DC5V or 3 * AAA batteries(not included). 1. If using AAA batteries, you can touch any keys to turn on the backlight for 5 seconds. 2. AAA batteries are just used for time memory, it means if using batteries, once you power off, and turn on the clock again, the clock will still work for time. 3. Please peel off the protective film on the mirror before use.